Hi everyone! I have a fun freebie for you today! 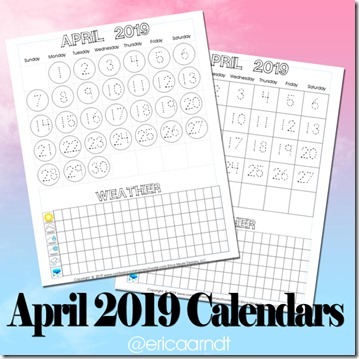 My April 2019 FREE monthly printable calendars are ready for download! For kiddos who need more handwriting and number writing practice, I’ve created a traceable version where they can practice number formation and counting. I’ve also created one with numbers already printed for students not ready for handwriting, or for students who already know how to write numbers well. To use the traceable calendar: Have students use a marker or pencil to trace each number, then have student count up to today’s number. To use the dot calendar: Have students a bingo dabber or small stickers to mark each day as it passes. Have students start back at one and count up to today’s number for counting practice. If they’re ready you might also encourage them to count only odd or even numbers. Have students create a pattern as they write/mark their dates! For example write odd numbers in red and even numbers in blue (ABA pattern). For more advanced patterns, use multiple colors to create more patterns. You can also use stickers to create patterns, for example on day 1 put a star sticker, day 2 a smiley face, day 3 a star, and so on. See below for more pattern ideas. There are lots of ways to create patterns, so feel free to get creative with your calendars! Weather: I’ve also included a small weather graph at the bottom of the monthly calendar as well. Have students either color one square or put an “x” in one square for the appropriate weather each day. At the end of the month compare to see which type of weather was most/least common. 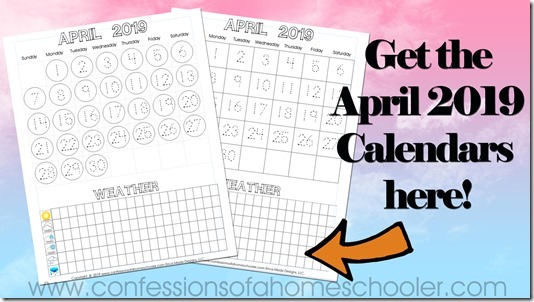 –>> Download the April 2019 Printable Calendar pages here! Thanks for stopping by today, I hope you enjoy these monthly calendars and that they make your homeschool days a little more fun and engaging!